Bias binding is an excellent thing to have on hand as it can be used for making piping, covering edges and creating facings. It comes in many different widths and folds as well as fabric types. You can even make your own! 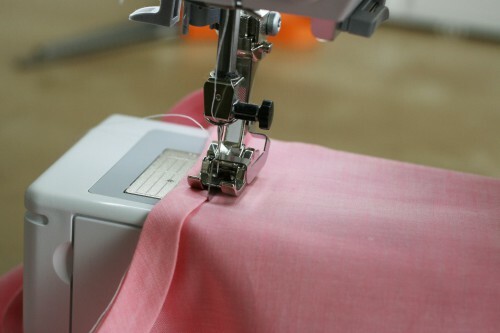 For some garments, you may want to use bias binding to finish the edges instead of facings. This is an excellent idea for thin or sheer fabrics. There are two ways to do this: one is decorative and functional, the other simply functional. 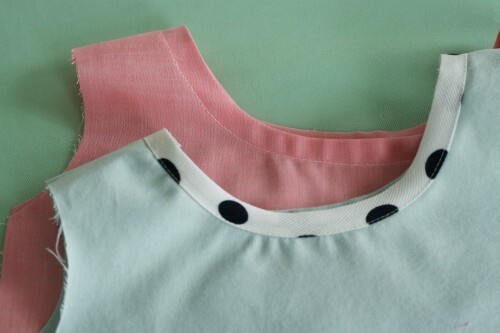 The Sorbetto top uses bias binding as a decorative facing. In place of a regular facing, use these instructions to attach bias binding to your garment. Remember that you can use whatever color fabric you like, but if using a thin or sheer fabric, try to use a lightweight fabric. This will keep any curves from waving or standing away from your body. Place a pin at the center back. About 1″ away from the center back, pin the bias tape open, leaving 2″ of tape hanging. 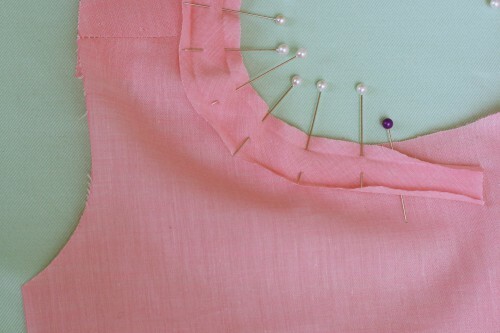 Walk the tape around the neckline carefully, pinning as you go. Pin the tape at least 1″ away from center back. Snip off a 2″ tail. Sew along the first fold of the tape. Take care not to pull at the garment or the tape. 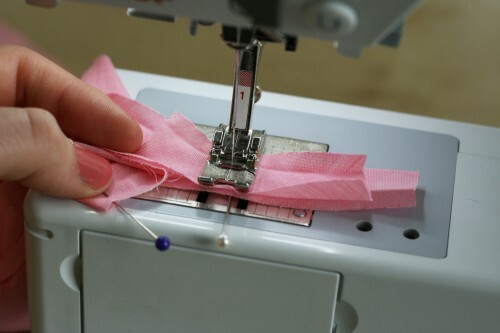 After you finish sewing the tape, put the two ends together and lay it against the garment. You’re figuring out where to stitch the tape together. 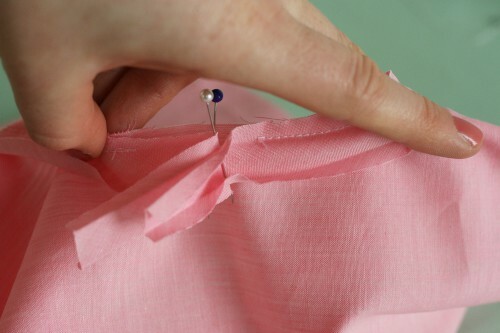 Place a pin in the tape, marking where you’ll sew them together. Sew the tape together. 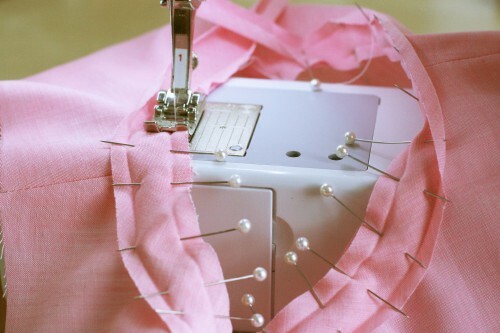 Stitch closely to the pin but make sure not to stitch on it. 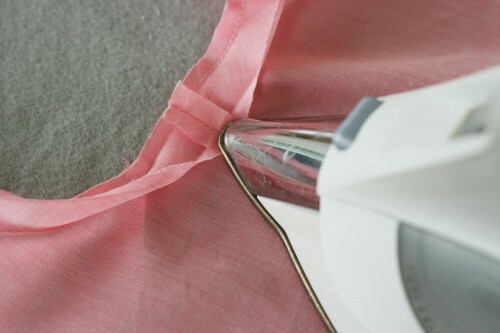 Trim the seam allowance to 1/4″ and press open. Finish sewing the bias tape to the garment. 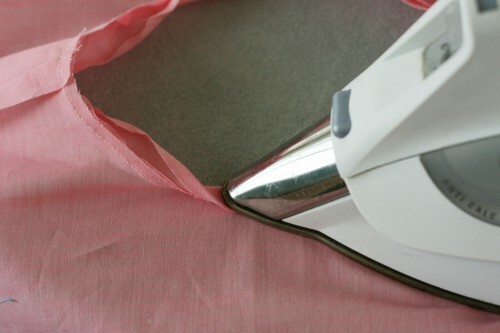 Iron the tape toward the inside of the garment. Make sure none of the tape is peeping over the edge. 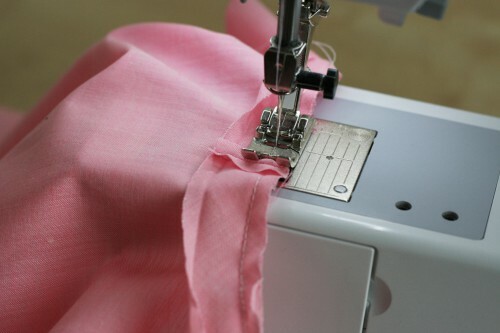 Using an edgestitch foot, seam guide, or merely eyeballing it, stitch close to the edge of the bias tape. Trim threads. Press to finish. Thanks so much for posting this! The Sorbetto blouse is the first I’ve ever made, and I was JUST scouring your blog for a tutorial on the bias tape binding! I successfully made it last night, and tonight I’ll attach it to the shirt… I’m sure with this tutorial I can’t go wrong! Thanks again.. I have really enjoyed your site as inspiration. Clear and simple – Thanks! I’ve always wondered how you join the binding. Thank you so much for posting. Wooo Hoo!! I’m at this step with the blouse today, and was having difficulty as to how to approach this . Thank you, thank you. Great tutorial. Um….I was always taught to clip the inside seam allowance when sewing on a curve, even with binding. So it doesn’t pull, and will lay flat. Do you do this as well? I think you do it when it’s necessary. It depends on the fabric. This may seem like a silly question but would a bias binding like this work instead of a facing on the Crepe dress neckline and sleeves? I think this might look neater for the fabric I am working with. Thanks for the help! Really wonderful patterns. Thank you, so much for posting this! I’ve been wanting to learn how to do necklines for a while. I believe it’s called “Seams Great” and I did a quick search on ebay where there are several sellers of this product. This is something that I use on a regular basis and I love it. How do you get the edge to lay flat on the neckline when using bias tape? the lowest part of the neckline on my top (which isn’t very low) wants to spring out. I have had to resort to facings again to get the fabric to cooperate. Instead of replacing the whole zipper?? Thanks. Very clever and useful. After lots of internet searches, and remembering past projects I was not happy with, I discovered your easy method to finish binding tape for a blouse neckline (fabric was gauze) and used it. I couldn’t believe how easy it was. Because I tend to get things “crooked,” and wanted to do it right, I was very careful about lining up the two end pieces before pinning, then sewing them together to get a seam. I not only pinned, per your suggestion, but drew the line (to make sure). It all went together easily and I only wish I had done this ages ago! Much simpler than trying to figure out 45 degree angles. I’ll be saving your instructions for the future. Thank you so much. but seem to be getting no-where! How long does the bias tape have to be? Is there a way to measure from my neckline? Thanks ever so much for sharing your knowledge in such a simple and easy way.